River X Racing is proud to bring a new marathon paddle race format to North America. A 24-hour marathon paddling race where solo, tandem, and relay teams race against the clock to complete as many laps of a 10km course as possible in 24 hours. The 24-Hours of River X. Time is your toughest competition. Not only a marathon paddle race, the Algonquin Outfitters 24-Hours of River X is also about teammates, families and friends coming together as a larger paddling community and sharing the camaraderie of friendly competition. The Algonquin Outfitters 24-Hours of River X is a great weekend of paddle sport racing hosted within a festival-style camp site in the heart of downtown Huntsville. Teams are stationed out of a central event headquarters; River Mill Park, Huntsville, Ontario. Each team is assigned an area in the park from which they have support, and transition relay team members. Teams paddle from River Mill Park, along the Muskoka River to Fairy Lake. Following the sheltered western shore of Fairy Lake, teams make their way towards the historic Brunel Locks where they turn-around a buoy in the North branch of the Muskoka River. They then retrace their route to the transition zone at river mill park. Upon arriving at River Mill Park, teams exit the water and portage their watercraft through the transition area, confirming their lap with race marshals and receiving support and resupplies from support teams. Relay teams can change their paddlers within the designated transition zone. Teams then re-enter the Muskoka River and complete the process all over again, paddling as much as they can (or as little as they want) for 24-hours. The team that completes the most laps will be crowed the winner, in each category. 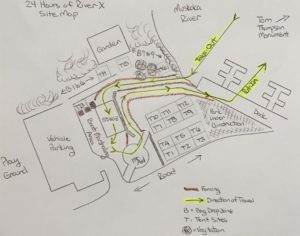 Located in the town of Huntsville, it is easy to understand why this is the perfect place to host the Algonquin Outfitters 24-Hours of River X. River Mill park is centrally located in the heart of downtown Huntsville. Surrounded by dock-side restaurants, boutique shopping, a short portage from drive-up accommodations, and with Muskoka’s premiere outfitter, Algonquin Outfitters, located right next door there is lots to do for the family, friends or teammates waiting for their next lap. There is even a fully stocked playground on site for the kids. The park features a large open grassy area, band stand, and parking for overnight vehicle camping. And with dockside access to the Muskoka River and the expansive Muskoka watershed this setting is natural stadium for paddle sport racing. 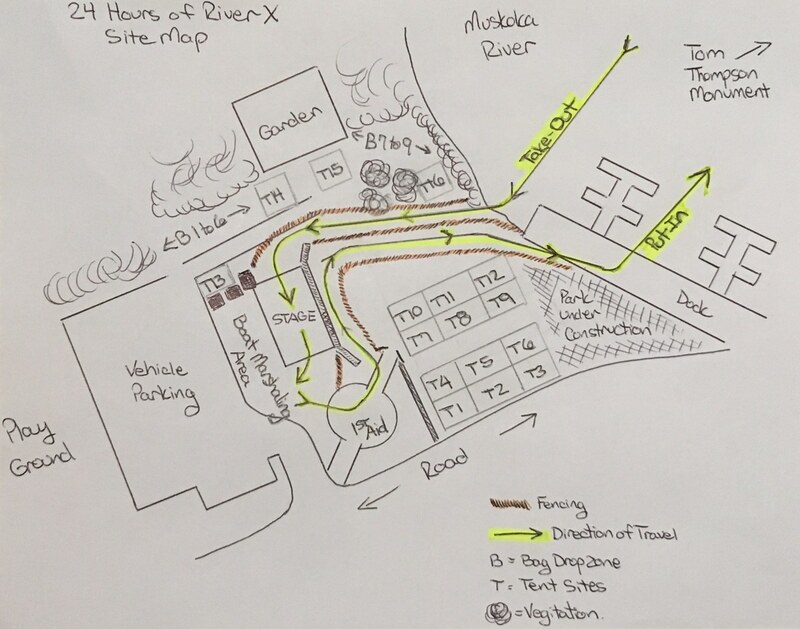 Located about 2.5 hours from the greater Toronto area, 4 hours from Ottawa and 5.5 hours from Windsor, its easy to see why the Algonquin Outfitters 24-Hours of River X is a great weekend of fun and competition. The course is a 10 km out-and-back loop with a short portage at one end. Starts at the bandshell in River Mill Park, boat put in at Town Docks, paddle to the turn around near Brunel Locks, then paddle back to beach on north side of Town Docks, portage to the bandshell in River Mill Park. All boats must be portaged in River Mill Park. No individual 12 years or younger shall participate in the event unless accompanied by an individual 18 years of age or older. Competitors 17 years of age or younger require a signed waiver from a parent or legal guardian. No competitor 12 years of age or younger shall compete in the solo categories.